It's been four-and-a-half long years since our last Scottish Cup victory. The 2009 Final victory against Falkirk was our 33rd Scottish Cup triumph from the 51 finals we have contested. Those four-and-half-years seem like a lifetime ago when you consider the trials and tribulations that have engulfed our football club since the 2009 Final. However, it pales into insignificance when you consider that, from 1903 until 1928, the famous old trophy on not one occasion graced the sideboard inside Ibrox. The 25 year 'hoodoo', as it was described by all in Scottish football, straddled the reign of our first two managers, William Wilton ( Mr Wilton was manager in the 1903 victory) and William Struth. 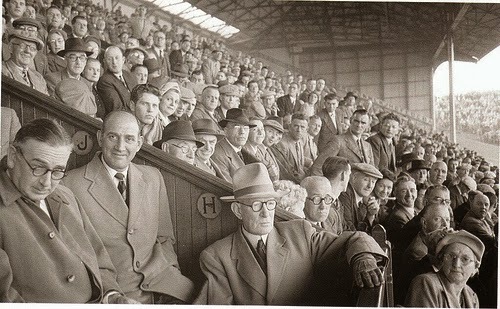 It occurred in an era before our magnificent Main Stand had been constructed, and had Rangers greats such as David Meiklejohn, Sandy Archibald, Andy Cunningham and Alan Morton in serious danger of finishing their careers with no Scottish Cup Medal, which was the premier competition in Scotland at the time, described by Rangers first Historian John Allan as ' footballs most precious prize'. Front and Centre is Rangers first historian, John Allan. In the 25 years between the 1903 Scottish Cup victory against Hearts and the 1928 triumph against Celtic, Rangers had only appeared in five finals, beaten by Celtic (1904), Third Lanark (1905), Partick Thistle (1921) and Morton (1922). 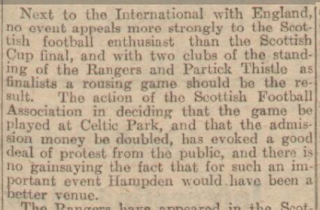 The final in 1909 v Celtic saw the Cup withheld after riots at Hampden Park, worthy of an article to itself. That quarter of a century also saw Rangers win the league title on 11 occasions. The Rangers teams that spanned these decades were by no means unsuccessful – indeed the Rangers of the 1920s are arguably one of the best to have graced the Ibrox pitch, under the stewardship of Bill Struth. This success was what gave rise to the phrase 'hoodoo' being widely used and believed by fans, players and press alike. How could such a successful side be so unsuccessful in their quest for the most sought after trophy? The 1904 Final saw Rangers take a 2-0 lead over Celtic within the first 12 minutes, only to be undone by the goals of Jimmy Quinn who became the first player to score a hat-trick in a Scottish Cup Final. This result was all the more baffling as Rangers four weeks later thrashed Celtic 5-2 in the Charity Cup Final at the same venue. The 1905 Final v Third Lanark came at the conclusion of a season which saw extensive changes in personnel, described as a season of 'severe injuries'. Despite that, the team challenged for all major honours, and were beaten to the Scottish Cup in a replay by 3 goals to 1. The 1921 Final seemed to be a series of events that transpired against Rangers, and would only fuel claims of a 'hoodoo'. The opponents were the unfancied Partick Thistle and the Final was set for Celtic Park, an inexplicable venue decision by the SFA, who were anxious to keep the attendance lower than the year before. 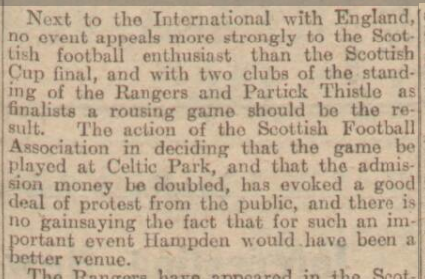 The SFA also doubled the admission price from 12 months previous from one shilling to two shillings. A national newspaper waged a vigorous campaign against the SFA, which provoked something of a boycott and only 28,294 fans attended. The tactics of the SFA clearly worked, however: the final of the previous year between Kilmarnock and Albion Rovers had been attended by a Scottish Cup Final record of the time of 95,000! Rangers were massive favourites – the starting XI was considered the strongest available – and they were unbeaten in the previous 20 matches. Rangers attacked from the start and put incessant pressure on the Partick goal. With half an hour gone, Rangers Jimmy Bowie had gone up the tunnel to replace a torn pair of shorts when Partick broke away to score the only goal of the game. Partick veteran Jimmy McMenemy said his cup medal would be hung on his wall with a horseshoe on either side. The Cup hoodoo had struck again. 1922 saw Rangers play Morton in the Final, and again, their luck deserted them. Alan Morton struck the post in the first few seconds of the match and from then it was all Rangers. Morton's first foray in Rangers' half came after nine minutes. They won a free-kick which they scored through Jimmy Gourlay. The real blow, however, came on the 17th minute. Captain Andy Cunningham had to leave the field with a broken jaw, and with no substitutes back then, Rangers played with 10 men for the remainder of the match. Despite this, Rangers laid siege to the Morton goal, only to be defied by the Morton goalkeeper who 'defied the laws of gravity!'. Bill Struth missed most of the match when he accompanied Andy Cunningham to hospital; the Morton manager followed most of the match from his dressing room as he couldn't stand the tension. Rangers Chairman, Sir John Ure Primrose, speaking on behalf of the Club afterwards was said to "resemble a man reading his own funeral oration." 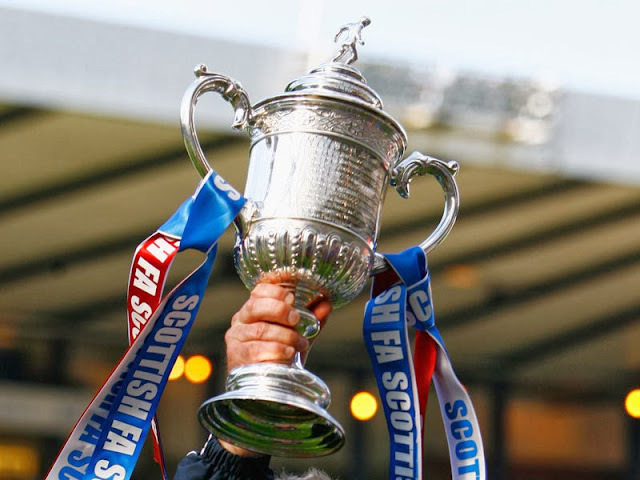 Morton had won their only major trophy to date, the Rangers hoodoo entered its 19th year! All told, 118,114 fans packed into Hampden Park the following day. Rangers were fancied, however very few people were willing to bet on a Rangers' victory, just because of the hoodoo, the story of ill luck, the odd goal defeats and of chances made and not taken. Their luck deserted them even at the toss of the coin before the match started. Meiklejohn called 'Heads' and the coin faced up tails. Rangers were up against their hoodoo and a howling wind for the first half. Celtic attacked and attacked for 45 minutes – Rangers goalkeeper Tom Hamilton pulled off some miraculous saves whilst the 'backs' of Bob Hamilton, Gray and Meiklejohn kept Celtic at bay for the first half. The teams reappeared for the second half, the wind had not abated and Rangers started the second half with all guns blazing. Archibald and Morton were starting to dazzle on the wings and Celtic were defending desperately. Jimmy Fleming thundered in a shot – it beat the Celtic goalkeeper, the ball was about to hit the back of the net…and then… the hoodoo stepped in! The Celtic captain, Willie McStay, had dived desperately at the ball and stopped it from crossing the line, with his hand! If Rangers scored there would be no stopping them. If they missed, the hoodoo would surely have entered the thoughts of all the Rangers men inside Hampden Park and burdened them for the remainder of the match. But who would take it? The rule at Ibrox in those days was that you took the penalties until you missed. Bob McPhail had been the penalty taker that season but had missed his last penalty kick. Up stepped the captain, the stalwart David Meiklejohn, the man who was coming to end of his career without a Scottish Cup winners medal to his name. With not a sound in the stadium, he walked back, looked for a second at the Celtic goalkeeper, ran forward and, at 4:01 p.m., lashed the ball into the back of the net. Afterwards, Mr. Meiklejohn said, "I saw, in a flash, the whole picture of our striving to win the Cup. I saw all the dire flicks of fortune which had beaten us when we should have won. That ball should have been in the net. It was on the penalty spot instead. If I scored we would win; if I failed, we could be beaten. It was a moment of agony." The referee, Willie Bell, later conceded that Flemings shot had indeed crossed the line by "perhaps a good two feet." but a moments hesitation led him to award the penalty rather than the goal. With the hoodoo now on its way out the Rangers went on to score another three goals without reply. A 4-0 victory followed against our greatest rivals. The Rangers support serenaded their heroes with 'The Bonnie Wells o'Wearie' long before the final whistle. Never was there a more triumphant procession than that which took the Rangers party from Hampden to the city centre. That evening, at the Princess Theatre, it wasn't a model of the Scottish Cup that comedian George West was holding in his hand – it was the real thing. The Rangers had taken it down to the theatre for the last night of the show. Delighted, West held it aloft and said, "Aye, this is the Scottish Cup. Rangers brought it here to get their own back on me. Man, they've shown me up as badly as they did Celtic at Hampden. But even though they've done me oot of a gag, I'm no' offended. 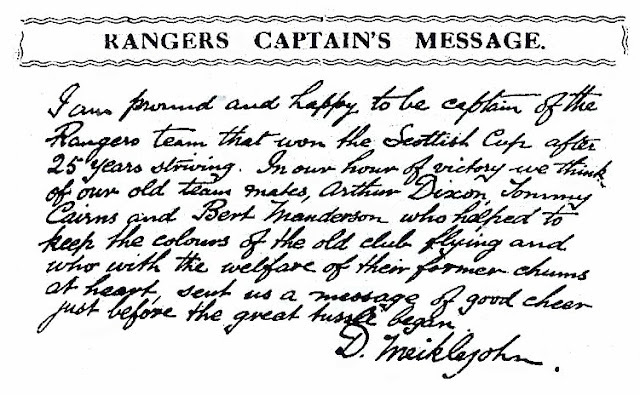 I congratulate them on their great victory and on the end of the Rangers hoodoo." I'll leave the last word, though, to a man whom winning the Scottish Cup meant more than the end of a long standing gag. At the celebration dinner that evening, Captain Meiklejohn said, "We have won it at last, we can do it again." He was, of course, correct.